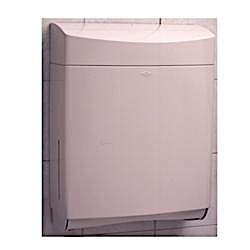 MRIMed's Surface Mounted Paper Towel Dispenser. This unit is made from durable ABS plastic and is a grey color. It is able to dispense 400 C-fold or 525 multifold towels that measure from 79-97mm deep without an adjustment or adapter. When more paper towels are needed the cabinet slots indicate refill time. The door has a concealed locking device.